A new spot for fresh tea, fruit tea and more has opened for business in the neighborhood. Located at 3247 S. White Road in the Evergreen neighborhood, the fresh arrival is called Tastea. The small chain of California-based shops has a second San Jose outpost in Berryessa. Specialties include Peach Me Sweetea, a peach and strawberry black tea; The Unknown, a mango and passion fruit black tea with diced longan; and Tootea Fruitea, a kiwi and pineapple black tea with diced jackfruit, lychee and longan. Craving the classics? Tastea offers premium jasmine green iced tea with salted cream and peach organic white iced tea. A variety of milk teas, cold brew coffees and smoothies are also on offer, along with snacks like popcorn chicken and fries. The new tea room has garnered rave reviews thus far, with a 4.5-star rating out of 49 reviews on Yelp. Yennhu N., who was among the first Yelpers to review the new spot on Sept. 17, wrote, "I ordered the Buttload'a Fries and a large matcha Thai milk tea. Both items came out relatively fast. The fries were piping hot and very crispy. It comes with sweet and sour sauce and ketchup. The portion is very big so it is definitely shareable. My drink was perfectly sweet and the boba was nice and soft, but chewy." Yelper Tiffany T. added, "Beware of the hype because it definitely gets crowded, but it really is worth the wait! The jasmine milk tea is one of the top ordered drinks. The tea itself was ordered as original, but the honey boba was what sweetened the drink more." 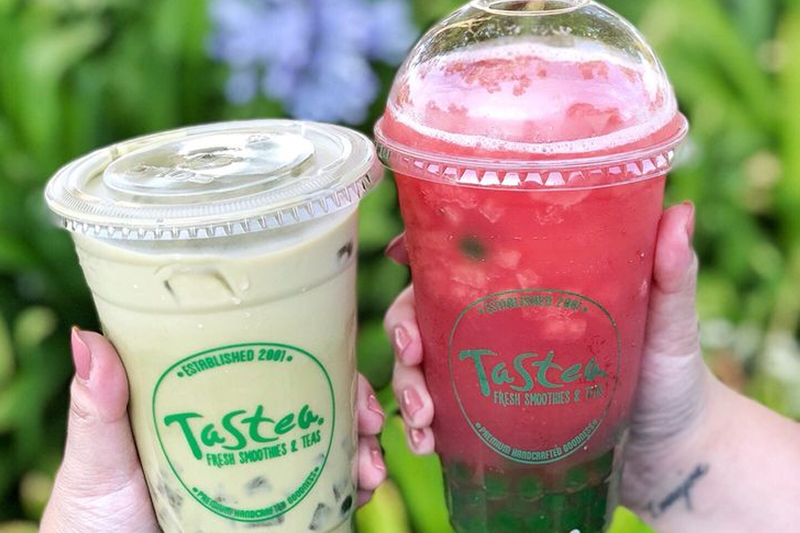 Swing on by to take a peek for yourself: Tastea is open from 11 a.m.-10 p.m. from Monday-Thursday and Sunday and 11 a.m.-midnight on Friday and Saturday.